The use of submarines in warfare has a history that dates back before World War I. As history shows, The Great War was the turning point where submarine warfare took place on a global scale. The terroristic acts of the German military on the high seas of the Atlantic Ocean did play a major role in the escalation of the war. Submarine warfare refers to the use of submerged, underwater crafts to launch offensive attacks on other warships. The issue many nations had with Germany and its U-boat warfare was that the nation was being extremely indiscriminate with its attack campaigns. Submarine warfare began in 1915. Germany was expected to adhere to what was known as Prize rules of submarine attacks. What these rules specified was rules of engagement for tankers and freighters carrying supplies to the enemy. Since freighters and tankers were not military boats and the crew was mainly merchantmen, the submarines were to come to the surface, search the ship, give the merchantmen the option to leave via lifeboat, and then sink the ship. On January 9, 1917, Germany announced a new policy known as unrestricted submarine warfare. As the name implies, this meant the German Navy was going to sink any and all ships it deemed threatening without warning. There were a few reasons why Germany made the decision to increase the amount of U-boat warfare and the level of aggressiveness the submarines were to employ. Germany was seeking to conquer Britain and a large amount of supplies were being shipped to the nation via freighter and tanker routes. Cutting off the amount of supplies would hamper Britain’s war efforts. Surfacing would leave the subs open to attack by the very formidable Royal Navy. As such, the subs began to ignore the Prize rule. Most importantly, there was a terrorism component to the attacks. By 1917, Germany was not succeeding very well with its military objectives. On the western front, Germany was losing ground badly. There was definitive fear if the United States entered the war, a loss was unavoidable. Unrestricted submarine warfare was enacted as a means of putting fear into those who might opt to challenge and confront Germany. Ironically, it was the increased use of submarine attacks that lead both the Unites States and Brazil to enter the war. 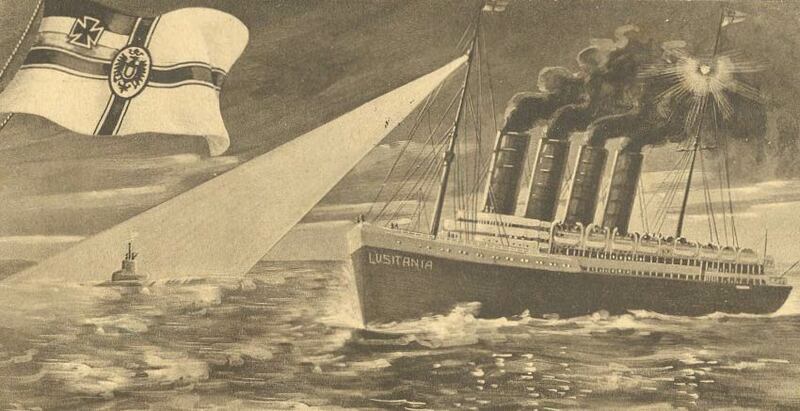 The sinking of the Lusitania was a precursor to unrestricted U-boat warfare. On May 7th, 1915, the British liner Lusitania was sunk by a German submarine. The incident resulted in 128 Americans being killed when the skip sunk. While President Woodrow Wilson wanted to avoid getting the U.S. involved in the war, public outcry over the sinking of the ship lead to great pressure to take action. Within a year following the Zimmerman Letter, the U.S. would become involved. On September 18th, 1916, the Germans announced their submarines would reach the surface before attacking. This may have reduced tensions somewhat. Over time, the decision was made to rescind this rule and unrestricted submarine warfare would become the official tactical policy.